Hello, everyone. Last month, we began a discussion about how polymer barrier properties can be broken down by permeation and higher storage test temperatures. This month, we’ll complete the discussion by reviewing how polymer glass transition temperature is modified by permeation and high storage test temperatures. Polymers have physical properties, such as tensile strength and barrier strength, that disappear when the polymer temperature is at or above the polymer glass transition temperature (Tg). In other words, a polymer loses all its physical properties, such as being a barrier, when the temperature of the polymer is raised above its Tg. The Tg for a dry polymer is higher than the corresponding Tg for a wet polymer. For example, the Tg for a dry epoxy coating is 100°C and the corresponding Tg for a wet epoxy ranges between 30°C and 60°C, depending on the chemical composition of a formula and the extent to which formula ingredients permeate the polymer. It is often assumed that a higher storage temperature will accelerate the rates of polymer and metal corrosion and thus reduce the time needed for corrosion testing. This assumption is based on the Arrhenius equation that states chemical reaction rates double for every 10°C increase in temperature. However, polymers do not follow the Arrhenius equation, as illustrated in Figure 1. The metal corrosion rate under a polybutadiene coating is plotted on the Y-axis and the corresponding temperature is plotted on the X-axis. The test fluid in this case is water. Notice that the corrosion rate decreases from approximately 0.016mm per year to 0.005mm per year (10-1.8 to 10-2.3) as the temperature increases from 20°C to 40°C. In other words, increasing the temperature from 20°C to 40°C does not accelerate the coating corrosion in this situation. Notice also in Figure 1 that the corrosion rate increases from approximately 0.004mm per year to 0.008mm per year when the temperature increases from 60°–80°C. However, the corrosion rate at 80°C should be 0.016mm per year if Arrhenius behavior is being observed. Consequently, some other mechanism explains the deflection point in Figure 1. Indeed, what actually happened in this situation is the 60°C temperature is at or above the wet polymer Tg and the wet polymer is no longer a barrier between the water and the underlying metal. 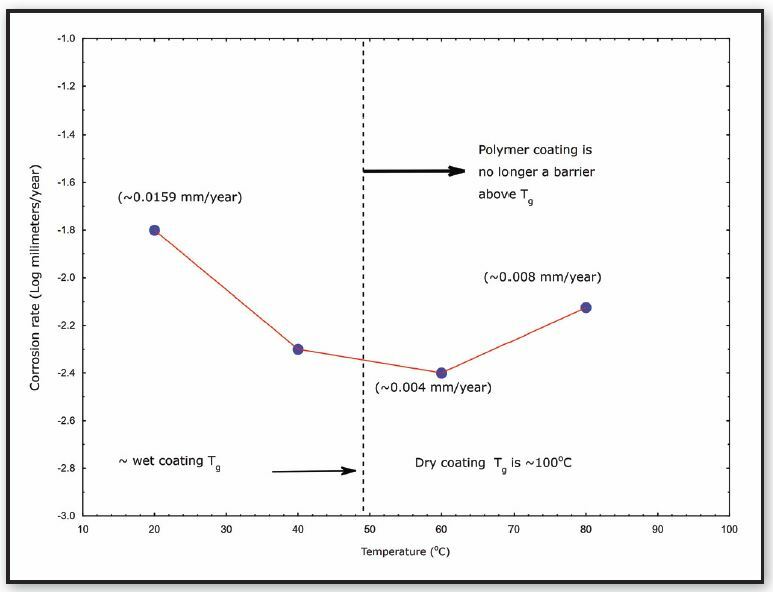 Thus, Figure 1 illustrates that wet polymer Tg is significantly lower than the dry polymer Tg. Temperatures at or above Tg cause a coating to lose its barrier properties, as evidenced by the higher metal corrosion rate. Data analysis and interpretation protocols.